Ok so I wanna talk about our most prized karate possession (our belt). I’ve been both seeing and hearing things lately about the good ol “traditions” of our karate belt or obi. Since my childhood I have always been told that in karate we “DO NOT” wash our belts. I was told that doing so would wash away the hard work, blood, sweat, tears, and knowledge that has been accumulated in the belt that we worked so hard to earn. Washing the belt would also be breaking a time honored tradition and would turn our symbol of knowledge and wisdom into nothing more than a piece of cloth. That’s a good question. I’ve heard a boat load of explanations and reasons as to why, again comes the hardwork, blood, sweat, tears thing. I’ve also heard that washing causes colored belts to fade and makes the belt look “less cool.” Another reason I’ve heard is that the inside filler is made up of a different material then the outside of the belt so washing it could cause the belt to fall apart. Another is the shrinking factor, The latter of the 2, actually seem like they make the most sense. I have had countless conversations with people about “to wash or not to wash” I’ve had parents of students, look at me like some kind of a filthy karate caveman, just for mentioning not washing a belt. They ask me why and I tell them the reason I was told and they look at me like some kind of zen weirdo!!! Then, I also hear from others that the “no washing” thing is an old myth, made up, not true, fake!!! “my soul drops from my gut… is this tradition I’ve been following my entire life just a made up story?? ?” Well this led me to do a little research of my own. Ok, so what about not washing? 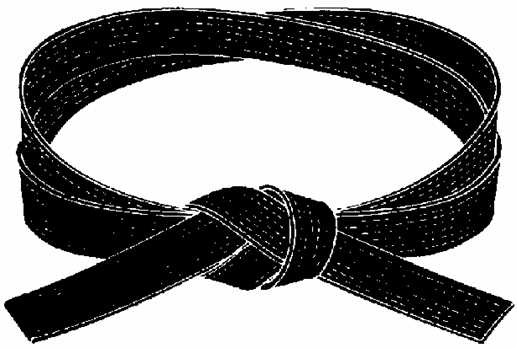 Well another story I’ve heard and read is that all students wore a white belt and through rigorous training the belt would then turn colors thru staining from sweat, blood, grass, dirt what have you, until the belt was eventually black. If you were to wash this belt it would lose its color, why? Because the color of the belt is just dirt! Kinda gross right? Hard to believe Funakoshi would have worn a white belt so filthy it turned black. Lets really think about how much it would take for a white belt to turn black. Not a pretty thought. Another story I’ve heard is that the belts were originally died darker colors, ie. yellows, greens, browns, etc. So this is the reason belts get darker because you had to die it the next color. Makes sense if you ask me? But what about now? Belts are no longer dyed the next color, nor are they stained with “hard work”. And, if I were to wash my sacred belt would I lose everything I’ve ever learned or attained from karate? Probably not, my belt would just smell a bit nicer. If I wore a different color belt or even bought a brand new one would my karate suffer for it? Probably not. So is it wrong to wash your belt? Or is it wrong to not wash your belt? The answer is neither. Its just a piece of cloth, not some sacred artifact that holds the teachings of all of martial arts. If it were, it probably would be in a museum somewhere and not around your waist. Now I personally have no desire to wash my belt at this time and I’m not telling you to do so. I thought it was a little interesting. What do you guys think? Any good belt stories? Do you wash you belt? Or not wash your belt? « Ryan Mooney, Windy City, 2012 Mens Individual Kata, 1st Place. I agree, I have was also told by my instructor, that washing your belt washes out the essence of the work you put into it, while wearing the belt. I never washed my belt. Personally, I like the worn look, not the torn look, but I, aIso heard, you can buy a belt that already, has the worn look. But I guess, anyone can buy a black belt also, if they have five bucks. Not that they earned it, but they can buy one. Ryan Mooney, Windy City, 2012 Mens Individual Kata, 1st Place.